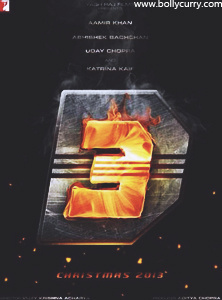 The First Look poster of YRF's much awaited upcoming movie Dhoom 3 was recently revealed on Christmas. In the poster, the letter D is shown with a fiery 3 with smoke coming off. The film, scheduled to release next Christmas, will once again star Abhishek Bachchan and Uday Chopra, with Aamir Khan and Katrina Kaif as the new additions. Abhishek Bachchan said in a recent award ceremony that they are currently about 50 percent through with the movie and that they just came back from a marathon schedule in the United States. He further added that they will resume shooting in Mumbai now. Katrina Kaif also said that she was shooting for the movie with Aamir Khan, who plays the role of the antagonist in the movie. We, at BollyCurry, sure are excited for the release of this movie and wish the film much success! Editors: Fari L. & Gunia M.
Wife turned my life into celebration: Akshay Kumar Happy Birthday Rajesh and Twinkle Khanna!